Ostfront: Cornered Wolf is a skirmish game aimed at 15mm, 20mm or 28mm miniatures, and aimed at representing the chaos of urban combat with the simplest possible rules. 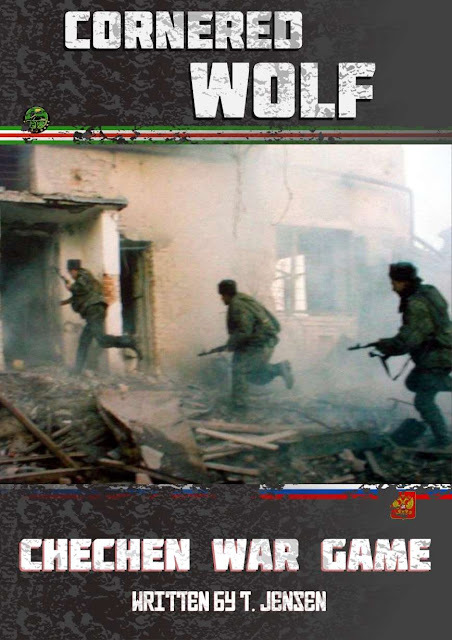 Uncertain activation, randomly generated forces, deployment that will throw you immediately into chaos, and quick and deadly rules will have you wargaming Chechnya in no time at all. Perfect for playing with younger family members, or for those of you who would prefer to make tactical decisions rather than look up a rule, Cornered Wolf provides everything you need for infantry, weapon teams, vehicles, multi-level buildings and suppression. These rules cover the basic infantryman armed with AK-47 or AK-74, RPG, SVD sniper rifle or PKM. Weapon Teams like the AGS-17 automatic grenade launcher, NSV heavy machine gun, 'fagot' anti-tank missile and mortars are also covered. Rules for vehicles cover the BTR-80, BMP-1 / BMP-2, ZSU-23-4 Shilka, 2K22 Tunguska, T-72 / T-80 and MT-LB. While the basis of this game is kept simple (No markers or tokens needed! ), extended rules are provided for players to introduce more detail. Extended rules allow troops to ride along inside (and on top of) vehicles, while extended wounding rules allow carrying wounded and loading them into vehicles. Evacuating wounded could potentially save you some points with regards to completing your mission objective. A points system is also provided for those who aren't too keen on randomly generated forces, although we strongly recommend at least trying the random generation as it makes for very interesting and still quite balanced games. A printer-friendly version of the rules is supplied.